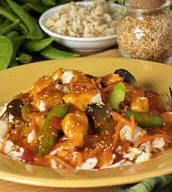 Fresh Chicken Poultry Dinner online: Chef prepared gourmet chicken dinner and side dishes. Chicken & Turkey dinner specials online. Our easy and delicious prepared poultry chicken & turkey foods are guaranteed fresheveryday. 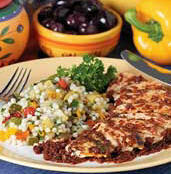 Our prepared poultry entrees and dinners are perfect for a quick-to-fix dinner or an elegant meal. You'll find a delightful assortment of marinated chicken breasts, impressive gourmet stuffed chicken breasts, classic smoked turkey and variety ofother tasty poultry selections! View our menu and order a take out dinner with quick overnight home delivery. Home Bistro chef prepared chicken dinner and meals... We create great recipes - everything from soups and appetizers to complete meals and desserts. Then, using only the finest ingredients, we prepare everything, with skill, know-how, and artistry, just for you. We do all the time-consuming things. We shop and we chop. We mix, blend, and saut�. We grill the steaks, roast the lamb, poach the salmon. All you need to do is follow the simple instructions to heat and serve our meals in about 10 minutes. It's that easy. 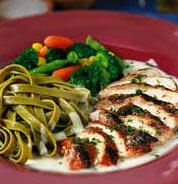 Blackened boneless chicken breast in a creamy champagne sauce served over spinach fettuccine and a medley of garden vegetables. 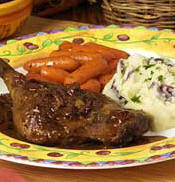 Classic duck leg confit in a delightful demi-glace made with the finest dried cherries, red wine, and shallots served with red skin mashed potatoes and roasted baby carrots with parsley. 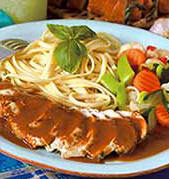 Grilled boneless chicken breast in a traditional Marsala wine sauce made with shallots and served with linguine pasta and a blend of crispy garden vegetables. Grilled boneless chicken breast in a classic Mediterranean-style tapenade made with sun-dried tomatoes, Kalamata olives, blended herbs and olive oil, served with Israeli couscous mixed with fire-roasted squash, zucchini, onions, and red peppers. 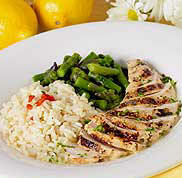 Grilled boneless chicken breast in a classic lemon butter sauce served with fluffy rice pilaf and tender cuts of asparagus. Tender cuts of saut�ed chicken breast in an Asian style sauce made with sesame seeds, toasted sesame seed oil, accompanied by tangy ginger rice and a blend of carrots, snap peas, and straw mushrooms.